In this article I am going to start prising the lid off a box of treasures so extraordinary that it should change your vision of prehistory. The tool I am going to use is Interlace Theory. 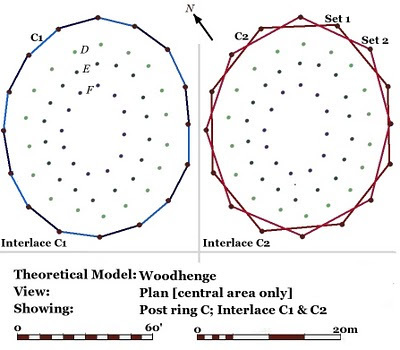 Due to the large number of drawings and illustrations involved, this article will deal with Interlace Theory and the next will deal with the detailed modelling of Woodhenge as a building. 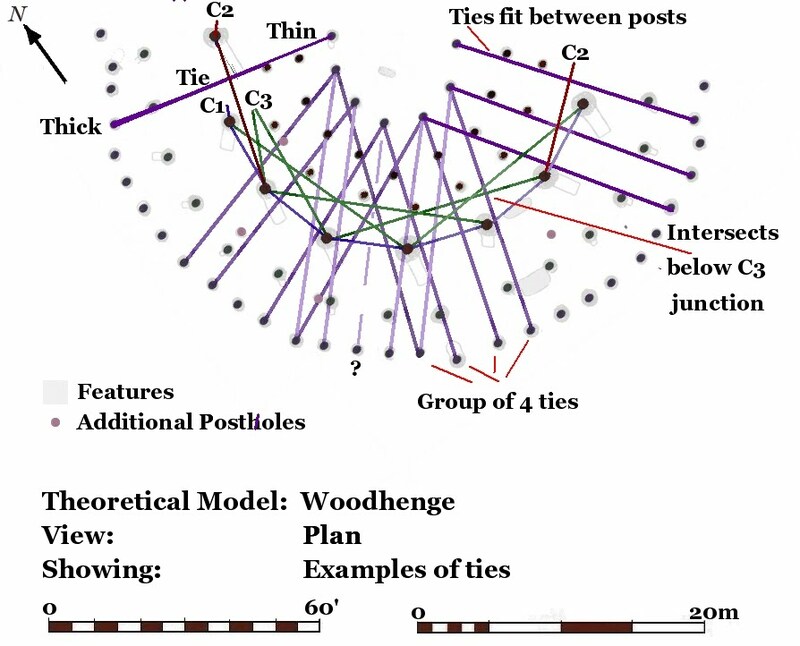 Interlace Theory explains how large prehistoric buildings like Woodhenge were constructed, and is based on the detailed structural analysis of archaeological plans. 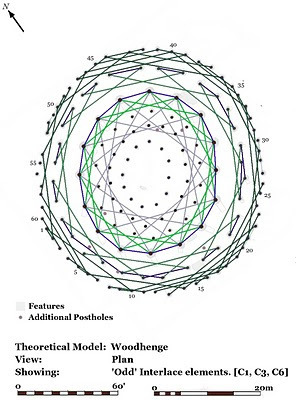 It can account for the precise position, function, and three-dimensional relationships of each of the 156 postholes at Woodhenge, with a reasonable degree of accuracy. 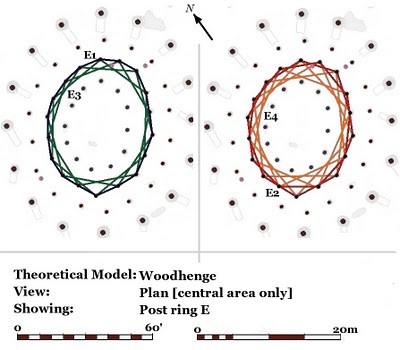 It resolves the series of problems with simplistic modelling discussed in the first part of this analysis of Woodhenge. 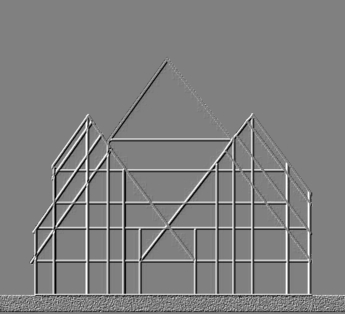 The simplified section above illustrates the basic form of structure we will be discussing, although detailed consideration of the building will be undertaken in the next article. 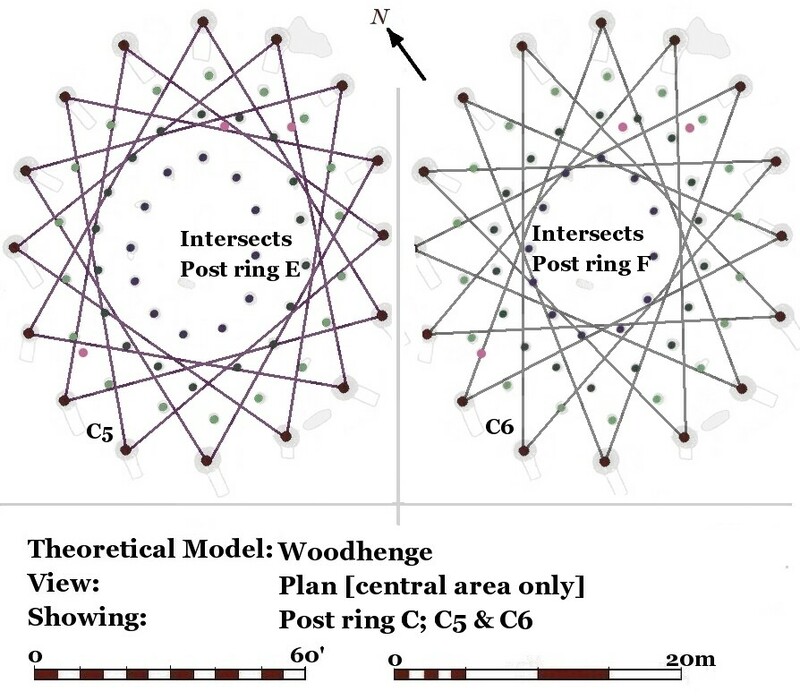 Woodhenge can be modelled as a pitched-roof annular structure with several floor levels. A multi-level roof facilitates a clerestory, as well as allowing the roofing of this complex shape. In the centre the building is dominated by a complex inverted cone of rafters and supporting timbers, above which is an upper floor covered by a conical roof. From its form, and in the light of all the other evidence from the site, I interpret this structure as a large vernacular building, which is probably best understood as a ‘palace’, in the sense of the residence of the household of an exceptionally powerful individual. Theoretical Structural Archaeology is concerned with "reverse engineering" buildings and structures from their foundations. New readers should be aware that this analysis builds on many techniques and concepts discussed previously on this site. Regular readers will now see where it has all been leading. I am sorry for the delay. The model of Woodhenge we shall be developing appears very complex when presented in plan and section. This is perhaps a reflection of the deeper reality that this structure was not originally conceived on paper. Any large timber building cannot reasonably be expected to be simple. Circular and annular buildings are no longer common, probably because they are inherently difficult to construct. 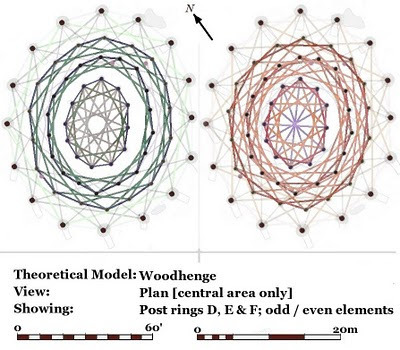 Consider the intricacies of historical timber frame buildings, which, being rectilinear, are a lot simpler than a complex polygon like Woodhenge. In this article I shall attempt to explain the underlying pattern in the ground plan and how this layout related to the creation of a building. We are elucidating a form of structure that is no longer built; it, and its component parts, are a theoretical conception. Thus, it is important to be clear and consistent with the use of terms. Each of the rings of postholes, or ‘post ring’, will be referred to as A-F, as designated by the excavator. The term ‘ring beam’ may be used to describe the three-dimensional projection of these features. 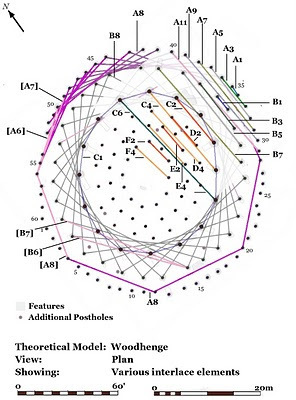 The structural components associated with each ring beam use the same notation; these are labelled numerically, i.e., C1, C2, etc., in a system described in detail below. To avoid any confusion with the original features' numbers (also labelled numerically by post ring), postholes will be referred to using the lower case, i.e., post ring C comprises postholes c1 – c16. The terms 'inner roof' and 'outer roof' refer to the inside and outside faces of the annular roof. 'Upper roof' and 'lower roof' refer to the roofs above and below the clerestory. Ties are horizontal timbers at right angles to a roof axis. Another similar timber is a brace; these are assumed to run diagonally in all planes, creating structural triangles to prevent racking. The ring beam elements are horizontal timbers joining the posts, ideally, parallel to the roof axis. In the simple terms used in earlier articles, they may act as: wall plate, arcade plate, ridge piece, and additional plate [term used only for ring beam D in the previous article]. However, apart from the latter, these are borrowed generic terms, and while they served well enough to describe LBK longhouses, they are rendered somewhat ineffectual by the complexity in this form of structure as described by Interlace Theory. While the architecture is complex, it has simple components, which are joined by mortice and tenon joints, probably held with pegs or tree nails. The scale of English timber buildings is intimately bound up with the growth patterns of one tree, the oak, or rather oaks (English and Sessile). Used whole, or split from thicker trunks, there are limits to the dimensions of the basic components. I expect architectural limits to be challenging, and try to keep an open mind as to what is possible and practical. Ultimately, it depends on resolving the nature of the timber inherent in the archaeological ground plans of individual buildings. Trees like oaks and other native species can reach a height of 40m and taller in good conditions, but how much of the trunk is straight and without branches is the key question. Also, it is of dubious benefit to have a 20m straight timber that is two metres thick at one end. It is reasonable to ask how long is a single baulk (rough-hewn piece of timber), or just how high could the central ring C post be? But, like the builder, I would have to see the trees, so we can’t be sure, but my money is on as tall as possible – why not? 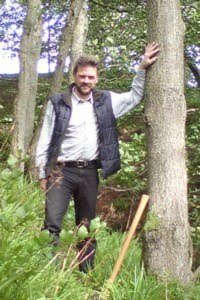 – the client may ‘own’ every tree in the area and beyond. The basic Neolithic model roof requires a tie across the base of it; the length of this timber can be viewed as a limiting factor. As a rough guide, 50’ is big, and 60’ is very big, applied to length of timber or width of a roof. Crucially, these spans are supported on many internal posts, so that individual spans are usually 25’ or less, but this, in itself, is another important limitation to be observed. 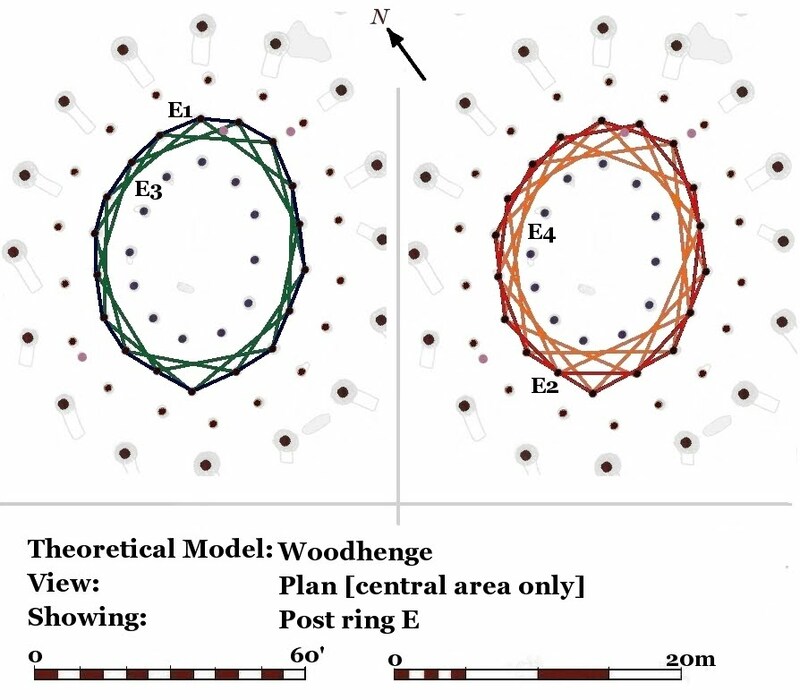 The model requires lots of trees about 60' in length and a few a little longer, which is not a surprise; the point about the scale of Woodhenge is that it is two wide roofs pushed almost back-to-back, with a cone of similar width covering the messy gap in the middle. In some respects, the tapering form of natural timber is as important as its length. Posts and rafters would be narrower at the top and wider at the bottom. The ties running across the width of the structure would have had a thick end and a thin end, and each end would require a post of appropriate diameter to support it. In common with most structures of this type, the postholes become progressively smaller towards the centre, the exception being ring C, marking the centre of the roof. The large postholes of ring C represent the tallest posts in the structure. Consistently placing the ties and other horizontal timbers with their thin end towards the centre of the structure is an effective way of mitigating the effects of taper. The height of ring C is the key dimension in reconstructing elevations and sections. It is reasonable, in this context, that the builders would have used the tallest trunks available: I would not expect timbers much above 20m, and certainly less than 25m. 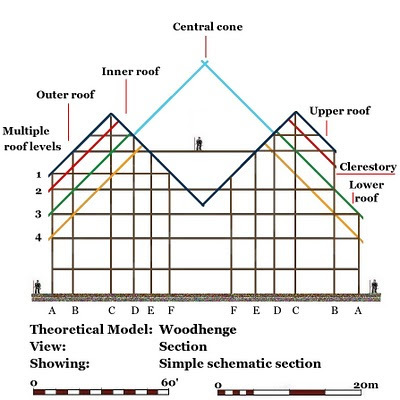 Another important consideration for the model is roof pitch: this should be greater than 45 degrees if the building was thatched, although less if turf or wooden shingles were used. In the drawing below, the archaeological base plan has been rotated about 31° from its standard N-S presentation. This aligns the plan with the rhombus forming the long and short axis of the ring C. This is not necessarily to imply this is the axis of the building, but it works better for the layout of the roof. Indeed, the idea of an ‘axis’ is probably far too simplistic a concept for such an asymmetrical and complex structure. 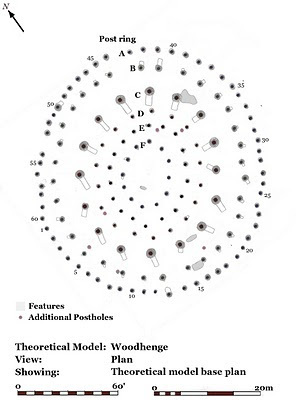 The model is based on a plan where each of the postholes is represented by a standard sized circular ‘post’ centred on the feature. It can be easier and less distracting to work with this form of plan, and it is often interesting to go back and overlay the model on the archaeological plan at a later stage. In a longhouse, provided that the walls on both sides are parallel to the ridge and the arcade, everything should work. 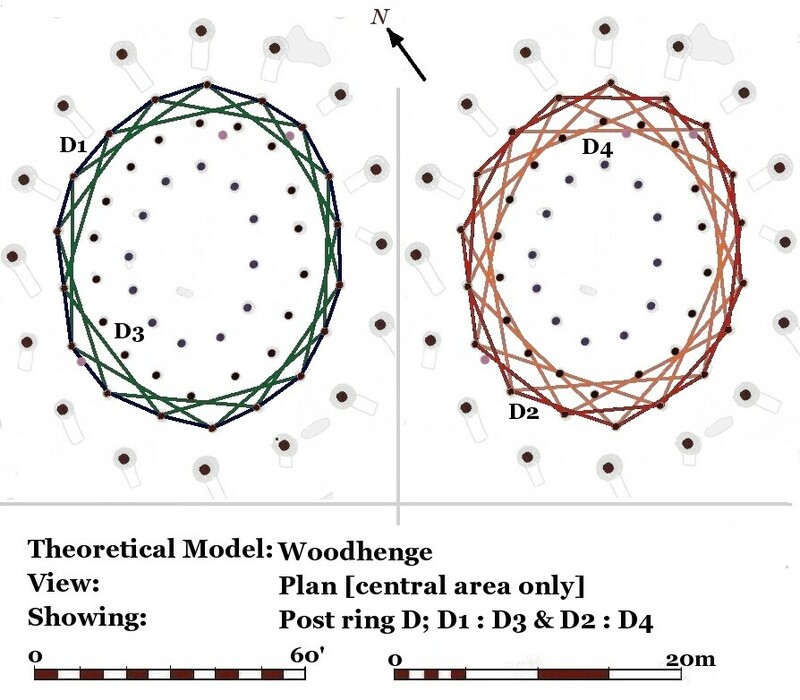 The principle problem inherent in the annular form of structure at Woodhenge is that each section of wall should be at the slightly different angle, in order to create the overall circular shape. 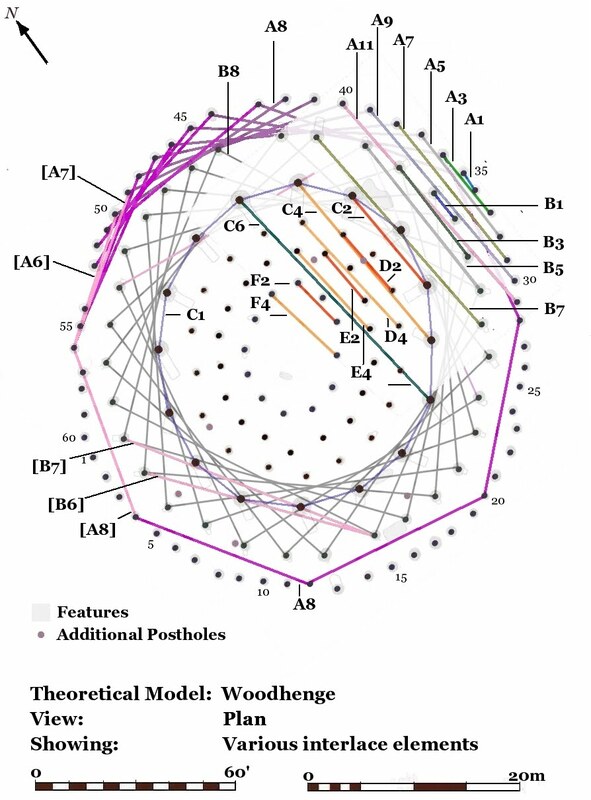 However, large circular structures, being made from straight sections of wood, are, in reality, polygons. 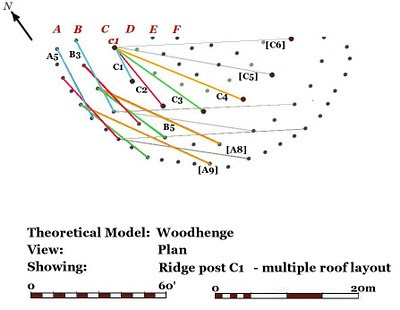 The difficulty in understanding Woodhenge is that Ridge C at the top of the roof is a slightly irregular 16-sided polygon, while the outer wall post ring A, at the bottom of the roof, is 60-sided, and by and large, a different shape than Ridge C. If the wall sections were parallel to the ridge, we would have a 16-sided building. Since they evidently are not, they must be parallel to something else. 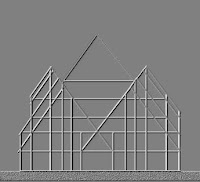 If we envisage a roof as parallel to the ridge, then, as the roof widens, we will end up with triangular areas below the posts with no covering. The way this problem can be solved is by introducing a second ridge by joining every second post of the post ring C together. This creates a different angle and can form a roof surface under the ‘gaps’ in the first roof. If you are going to make Early Bronze Age buildings this shape, you don’t have a lot of options. This is the start of Interlace Theory. 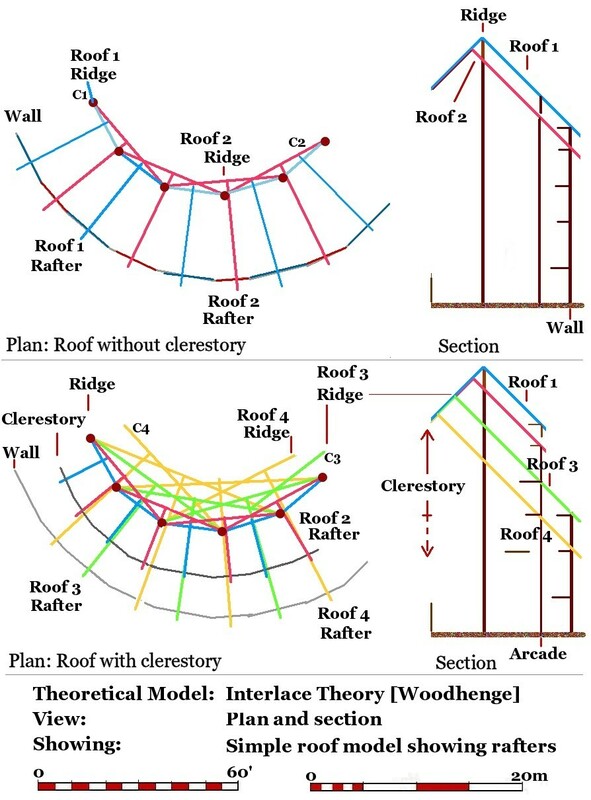 Interlace Theory attempts to explain how the horizontal elements of a post ring worked to facilitate a rigid structure with a curving roof surface. It starts with the notion that the posts of any ring may be joined together, not only by connecting each to the next one, but also by connecting them at different intervals, such as linking every second or third post. By joining the posts together with elements on these chords, a set of overlapping polygons are created within the circle. 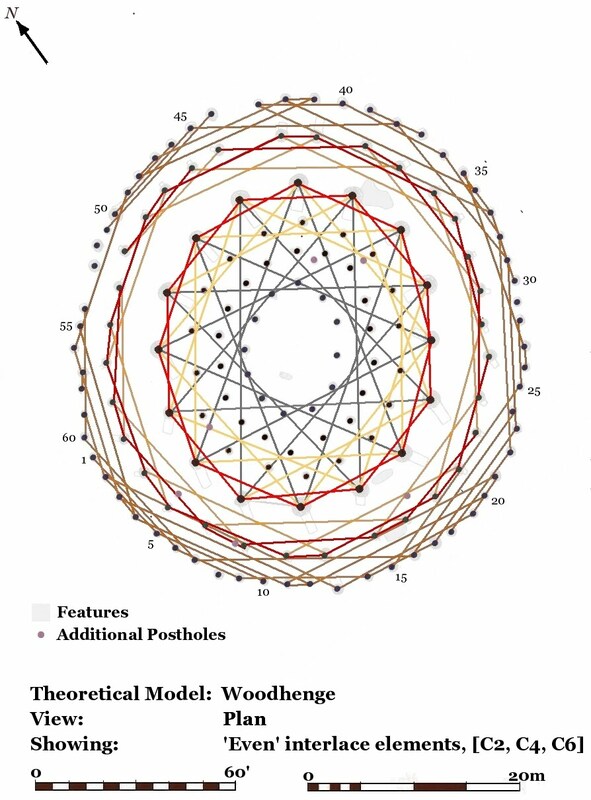 In a system of concentric post rings like Woodhenge, the longer chords of an outer ring will intersect with the posts of the ring inside it. post, interlace elements C2, it creates two overlapping octagons. The advantage of this for creating a simple curving roof, we have already noted. 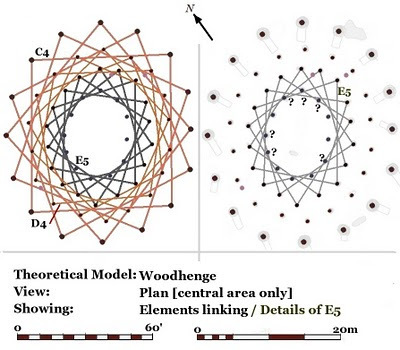 Joining every third post creates C3, and this pattern of elements is broadly parallel to C1, which will prove useful in modelling Woodhenge as a building. C3 comes close to post ring D on its southern side, but does not intersect. Layer C4 is mostly parallel to C2, and weaves its way through post ring D. However, while these elements would be very long and unlikely to be in one piece, the posts they pass next to, or in one case, through, could support them where the element sections intersect. In addition, ties running between post rings could have been used to support these longer elements. Having interlace elements ‘trapping’ posts in this way is advantageous, increasing the overall rigidity of the structure. The fact that the elements of layer C4 could interweave with the posts of D tells us that these timbers presumably must be lower than the top layer of the post ring D [D1]. We can also draw in elements C5, which intersects post ring E, and C6, that weave their way through post ring F. In both cases, the easterly side of post ring F is not intersected. Again, this gives us some idea of the height of these elements relative to the other post rings. The same provisos about length also apply. Elements C5 and C6 are parallel to C1 and C2 respectively. This is part of a wider pattern where ‘odd’ interlace elements [C1, C3 C5] tend to be parallel to each other, as do ‘even’ ones [C2, C4, C6]. In terms of post ring C, the interlace elements provide a series of parallel timbers at different heights, and, more importantly, a variety of angles to the outer wall. This was precisely what was missing from our simplistic model created by joining posts one to one. However, this latter model can only work if the other post rings, whose elements would have supported the roof, have similar properties. Each post in ring C has a series of structural relationships with its neighbouring posts in the ring. This creates a series of differing alignments which are reflected in the interlace elements of the neighbouring post rings. The result is a series of parallel timbers on each ring, at different heights, which support the roof. This property of the ground plan extends even to the very long elements C5 and C6. Thus the multiple angles of post ring C are reflected in the layout of the two outer post rings. We will consider the inner post rings later. The figure above illustrates how the geometry of the ‘odd’ elements of post ring C are reflected in some of the elements of post rings A and B. It is important to note that, for example, B5 elements can be parallel to C3 and C4. Thus, the ‘even’ elements illustrated above include various ‘odd’ elements, such as B1 and B5. The structure of post ring A is very irregular in places, reflecting the complexity of a multiple- roof structure. Having interlaced elements at different heights can facilitate the creation of a clerestory with windows to illuminate the floors in the roof space. While elements C1 and C2 form the upper roof, C3 and C4 respectively, can support a lower roof, the gap in between being the clerestory. 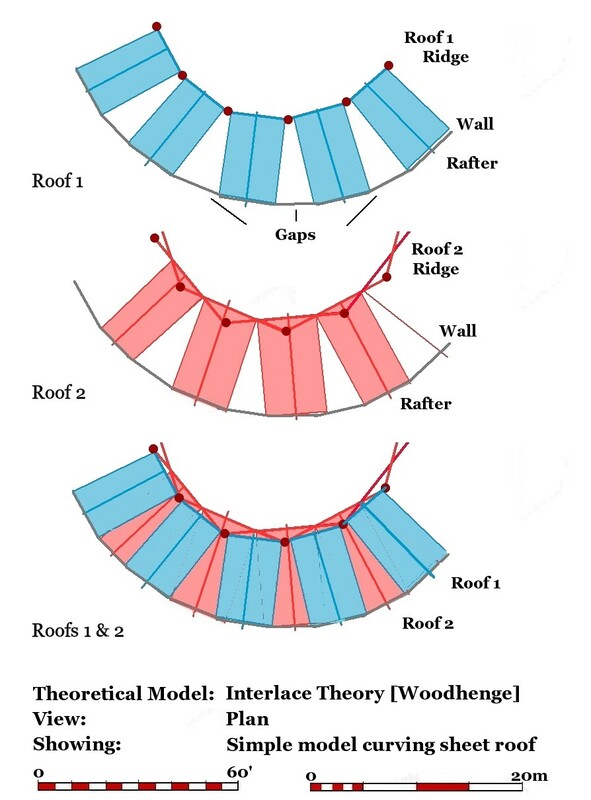 This method of roof construction keeps all the rafters on the inside slope in a similar plane. Creating an inverted cone of rafters would dominate the central area of the building. While this impacts on the utility of the centre of the building, it is quite a neat arrangement, and less messy than other possible methods of creating a clerestory. Post rings D, E and F.
The interlace elements of Post Ring D, have a pattern similar to ring C. However, D1 is not often parallel to D3, although D2 and D4 correspond fairly closely. D3 is close to post ring E on its southern side, which D4 intersects, but not on the eastern side. Post ring E is a similar shape to D, with flattened sides on the south side, and a more regular curve around the north. Elements E1 and E4 correspond well, as do E2 and E4. Unlike post rings C and D, E4 does not intersect the next post ring, F. As illustrated and discussed below, it is interlace element E5 that interacts with post ring F.
Post ring F is illustrated with ‘odd’ interlace elements F1, F3 and F5 forming a very regular pattern. The pattern of ‘even’ elements F2, F4 and F6 is very geometric and recalls the rhombus used to lay out the post ring C.
When we place elements 1:3 and 2:4 from post rings D, E, and F together, an overall pattern emerges. While some seem irregular, most have elements parallel to them in one of the other rings. The is an apparent gap between post rings E and F which should be occupied by E5. The linking elements intersecting with the next post ring are an important part of Interlace Theory. They are structurally very useful, and also give an indication of the relative height of the post rings. However, they do not tend to interweave with posts on the eastern side. This may suggest that, as with ring C, there are longer lower elements such as D5 or E6 present. E5 is quite problematic, in that some elements appear to pass through posts in ring F. This may imply that not all elements of E5 are present, or that the post in ring F is below the level of the particular E5 element. Thus, when we come to consider how many sets of interlaced elements may be present and how they interact with other post rings, we are faced with some contrary indications, such as those that pass over or through posts. The B8 elements of post ring B interweave with post ring C very well, with only one element [shown in pink] cutting a post. However, for example, a B6 and a B7 element [also in pink] would cut through a post in ring C. It is unclear whether these elements were not present or, perhaps, were jointed at the post they intersect. Post ring A, because of its irregular shape, presents similar quandaries. Interlace element A8 intersects post ring B on the northern side, but longer elements would be required to achieve this on the south side. However, A8 passed over (or through) a post, a57, on the east side, [shown in pink]. On this side even A6 and A7 elements cut across posts. The figure above also illustrates a single alignment of broadly parallel elements through the structure from F4 to A1. There are some subtle alterations in alignment of about a post's thickness, and clearly not all these elements are structurally related, being so close together, but it serves to illustrate the underlying structural logic in the layout. 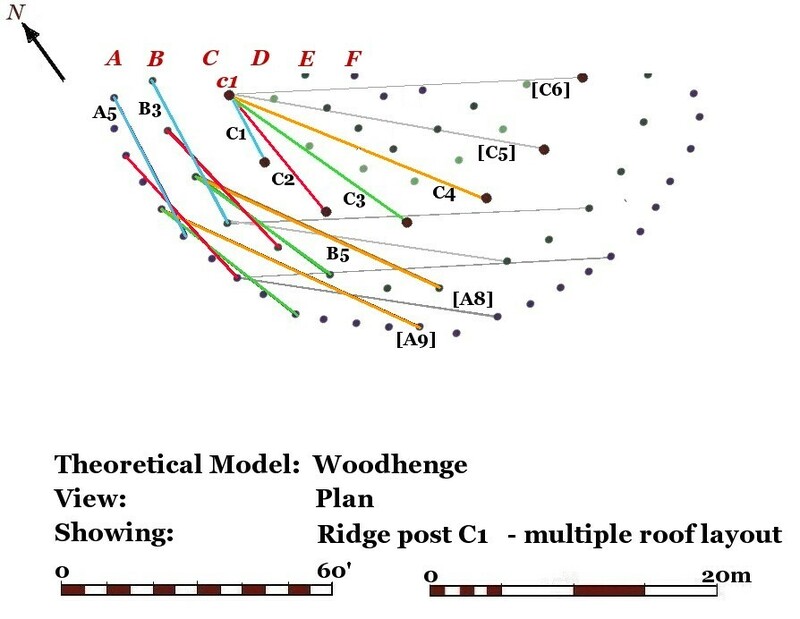 Most roofs consist of a few parallel elements, but Woodhenge has dozens of separate roof alignments combined to create its curving roof surface. The system of construction described by Interlace Theory can be visually confusing, and quite difficult to illustrate in a meaningful way. For example, one unfortunate consequence of Interlace Theory, when applied to such a complex structure, is that is that each rafter pair has its own individual section. If, as suggested, each interlace layer is in contact with each other layer at some point, we can build a virtual stratigraphy: [C1 – C2 – C3 – D1 –D2]. 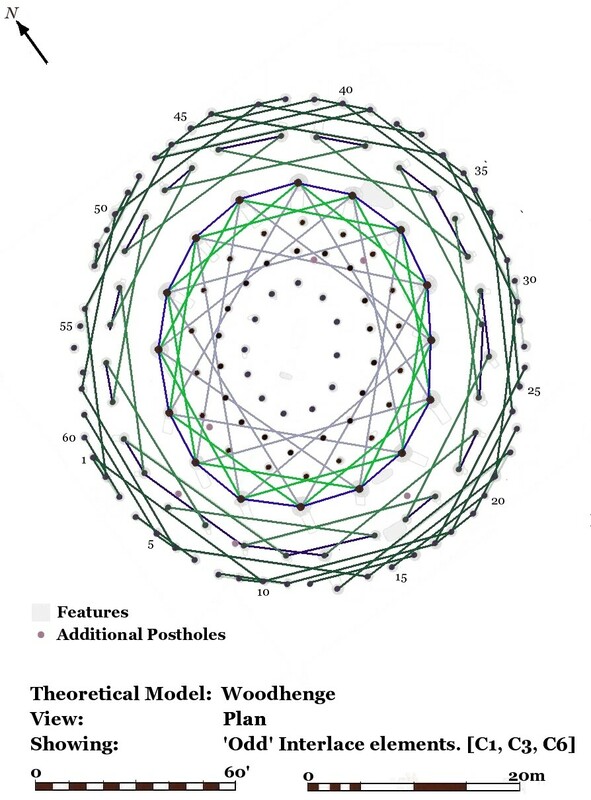 It is possible to build a simple spreadsheet model that adds up the thickness of each layer, given a standard diameter of timber. We can combine this with observations of how the interlace layers of each ring interact relative to each other. If we assume the timbers near the centre are 0.15m thick and start 3.0m from the ground, when we add up the interlace layers of C, D, E and F, we get a figure very close to 20m for the total thickness of timbers. This is close to the maximum height we expect for the building. 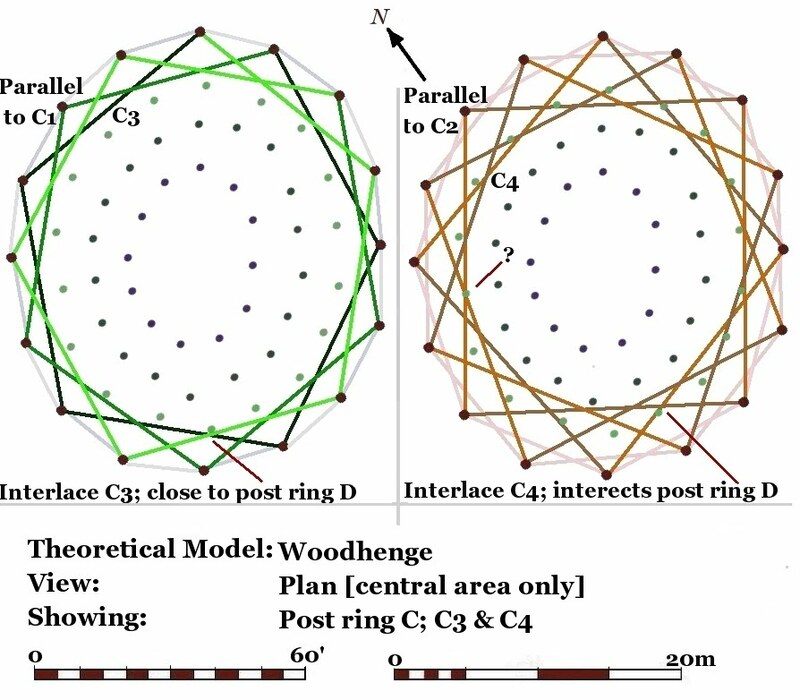 Thus, I think it possible that interlace structures like Woodhenge were constructed in a continuous series of interlocking polygons. 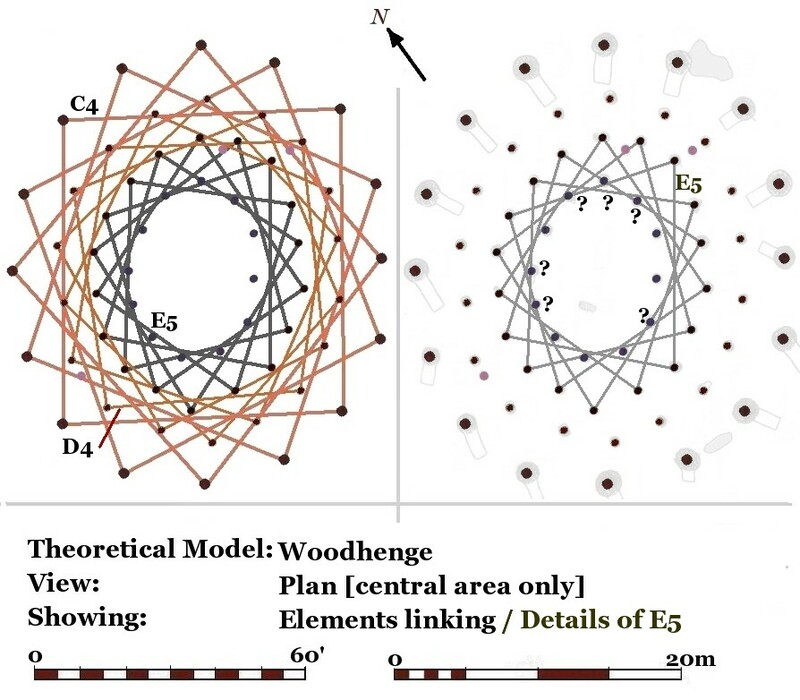 I am going to show you something else about the plan of Woodhenge that is quite remarkable, and is another aspect of Interlace Theory. In an earlier discussion of LBK longhouses, it was noted that the posts in the interior were laid out so that ties and bracing could weave between them. This ‘traps’ the post, keeping it in position, increasing the rigidity of the structures, just as we have demonstrated with the ‘element’ of the ring beams. 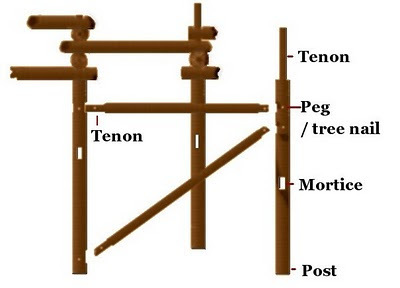 The ties in a reverse assembly building are the lowest layer of the timber assembly, sitting directly on the posts of the outer and inner post ring [A & F]. 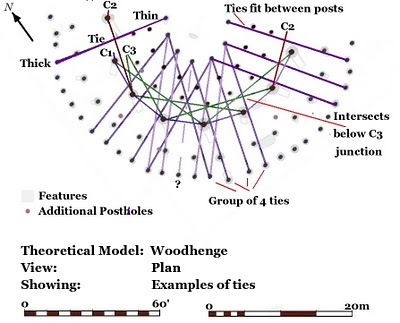 Since they are the lowest components in the structure, the post rings supporting the rest of the structure [B , C, D, & E] will have to be positioned to avoid the line of the ties. However, since most of these horizontal ties are in excess of 50’ long, they will have to be supported at at least one point on their way across the building. Thus, when you draw in the ties on the plan between A & F, they do not intersect any of the other posts, but pass immediately adjacent to them. This is actually quite an interesting phenomenon, and may indicate how you set about setting/laying out a building of this type. Ties are nominally at right angles to the roof and parallel to the rafter pair. Laying the ties on the ground, and positioning the posts in relation to them could be an important part of the construction process. 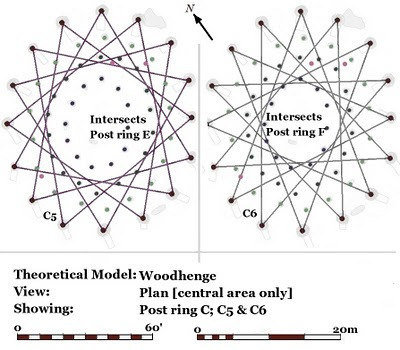 However, we have 60 posts in ring A, presumably with ties, to connect with the 12 posts of the inner ring F; that’s 5 outer posts to each inner post, and while they can’t all be at the same height, albeit we are dealing with the thin end of the timber, we are going to require several layers of ties to make this idea work. We can draw some reasonable ties onto the plan, almost all passing miraculously next to posts in the interior. We can see a complex pattern start to develop, not unlike the spokes of a bicycle wheel. However, this takes us into a more concise description of the building itself, to which we will return in next article. 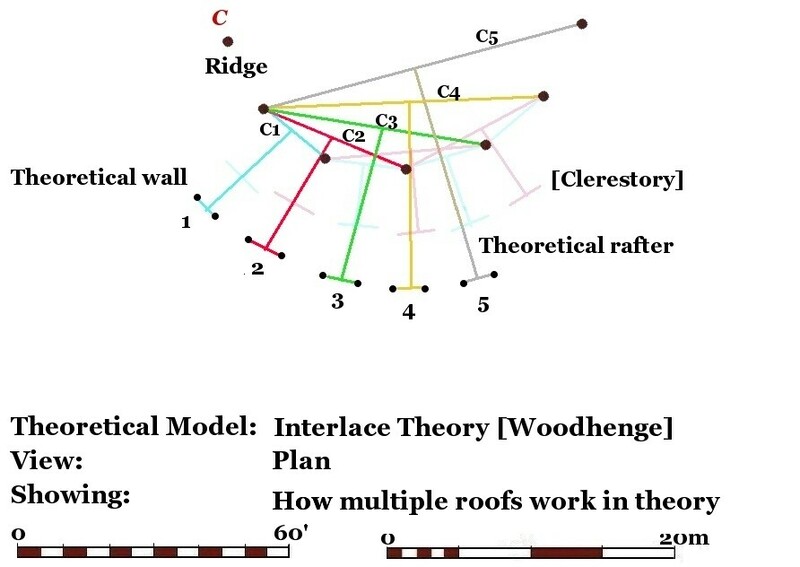 Interlace Theory explains how the vertical structural components evident in an archaeological ground plan of a building like Woodhenge could be connected in three dimensions to create a building with a curving roof. 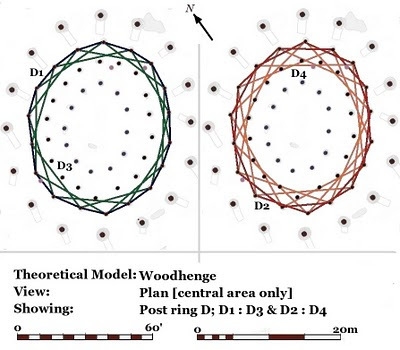 This form of structure solves all the problems noted with simplistic modelling of prehistoric ring beams described in the previous article. 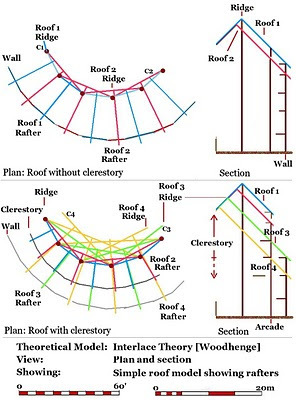 An interlace structure would be very rigid and strong, and create components with the appropriate geometric properties for creating a circular or curving roof. If, as suggested, the components, ring beam elements, and ties are assembled as a continuous series of interlocking layers, then, to some extent, Interlace Theory elucidates the actual method of construction. 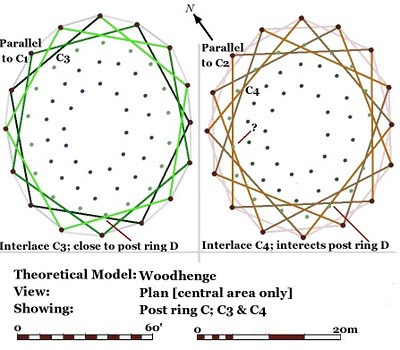 In the next article we will look in detail at how Interlace Theory can help model buildings like Woodhenge. 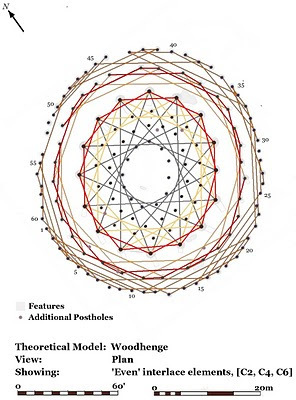 More on the myth of timber circles here. Congratulations! That's ingenious and interesting. Why did it have to be so complex? Might the roof panels have been movable awnings or hurdles rather than fixed thatch or slats? It seems that the emphasis was on the roof rather than on the internal space. Might it have been used as an observatory, opening particular sections to focus on certain stars at certain times? Thanks O R; the foundations of a building [postholes] are mostly there to support the roof, you can use hurdles and awning to divide the interior! You have to bare in mind that this building is 150' across, one of the biggest timber building ever built in prehistory, larger than any Neolithic longhouse [in all directions]. Think of the way English timber frame buildings are constructed, and scale it up. In the next post I will show it worked as a building, and consider issues like the nature of the internal space. Thanks for posting this. I like the idea. It's going to take some time to sink in and I will be re-reading this and the LBK house posts, I suspect. Are their any examples of documented 'ethnic' building techniques that use these methods on a smaller scale? Also I presume that it's relatively easy to transfer this idea to the Sanctuary. Have you given much thought to Stanton Drew? TSA is not a really a comparative method, and while I do know of annular buildings elsewhere, I will not mention them because they are not relevant. TSA is about reverse engineering buildings and structures from their foundations, and it assumes that each structure will be unique, and that it should be considered on its own terms. It has been my experience that interlace theory works for other Ei structures, certainly those for which we have a complete plan. I think Stanton Drew is unexcavated so I cannot comment - it could be a Tudor maze as far as I can tell from the Geophysics! Archaeology has to move on from simply looking for, and comparing shapes of things; all square buildings are not the same, and nor are all circular structures. Prehistorians get away with assumptions and concepts that are so simplistic, that would be considered ridiculous in periods where we have other sources of evidence. There is a lot more to come, but I had to start somewhere, so I hope you will be patient with me; modelling has to be precise and accurate. It is quite different from the opinion driven, and faith- based archaeology, that is usual in this period, in that it is does not deal with cosmologies, rituals, beliefs, perception or symbolism - only postholes, and the possible structural relationships of the posts they once contained. PS. Ned, thanks for your interest. If you have the time have a look at Mount Pleasant IV, in relation to the last figure in the article; [Try drawing in some ties between the outer and inner rings]. The deeper significance of Interlace Theory is that will eventually allow anyone, [preferably with CAD] to understand these structures, disenfranchising many of the existing stake holders. I sincerely hope the writing is on the wall for 'Ritual' as an explanation of postholes. I shall have a look at Mount Pleasant (although not with any kind of CAD). I can see your point already though about the differences between each structure. As for 'ritual' significance, I'd give it plenty of time to be overturned in Britain and parts of northern Europe (you can spot the British academic papers by the phrases they use, generally). It seems to have taken hold for an entire generation. As I see it, it is the job of professional archaeologists to interpret the sites they excavate; if they they don't do it, there will always be some academic who feel obliged to make something up. My work was felt to have no merit at Newcastle University as it does not address 'Iron Age roundhouse Cosmologies' - How people we have never met, felt about living in buildings we have never seen! As a professional archaeologist, I cannot address this conceit, since I can only deal with the evidence. I know that your "modelling" amounts to extensive study of the postholes and their relationships to each other. The experimental nature of it doesn't come across very much in the finished posts. How about a chapter on the nature of your "behind the scenes" work on this. TSA is a methodology; a way of thinking about the evidence, and it is very different from the way that students and others, consciously or subconsciously have been taught to view this type of evidence. It has taken me twenty years to develop, and I would love to able disseminate and teach it in a systemic way. [this is article 39]. Woodhenge and interlace theory is a bit ‘cut to the chase’, but my relationship with Newcastle University is now officially over, and I have to find a new route to market. My PhD was going to start with 4-post structures and work up, but I will have starved to death by the time I get to really big stuff. So I am going straight for one of biggest sites in the Prehistoric toy box. Prehistory, as taught, is as often about belief, in that the evidence we find is seen to derive from people who spiritually motivated, whereas TSA looks for technical motivation in things like the placing of postholes. The point about interlace theory, it gives you the basic rules of assembly to build a CAD model of this type of building; I started using CAD in 1990; but soon realised that sticking a cone on top of cylinder and calling it a roundhouse was of limited value. Postholes are about building and architecture, and once your can understand their structural relationships you can build them timber-by-timber in virtual reality. The reason modelling is time consuming and has to be accurate, in that is has to able to stand up to scrutiny of being rebuilt virtually. It is not an opinion. How modelling works; as I have said this before, it’s a jigsaw without the box, you don’t even know if you have all the bits. However, just like jigsaw, if you are dealing with a building foundation there is usually only one technically correct way it could be configured. Just like a pot, the bits either fit or they don’t. So a narrative of “ I tried that and it did not work” would be very tedious. However, I am very conscious of some rapid changes of gear in my articles, so once I nailed Class Ei buildings, I’ll do something gentler, probably on Four-post Granaries – if you remind me. I think it's important that people who read your blog realize that you are not just "imagining" a structure -- that you have studied the relationships of the postholes as well as what is known about the technology used at the time, then tried a number of different models until you find the one that works -- "the technically correct way it could be configured." Readers who are not familiar with your way of working may not realize the extensive amount of time you spend studying the possibilities before settling on a model. It might be tedious to read about it, but it's important that readers know the amount of study you have put into this. I have spent 6 months working on Woodhenge, but I did pick the most complex building I know! In my defence I keep noticing things, and everything has a knock on effect - even in reverse engineering. It not enough to know it's a building, knowing where the windows were positioned is what interests me. I will bare your comments in mind as I write part III. I hope there will be still enough doubt and ambiguity to keep it real; modelling 4000 year old structures from their foundations is not an exact science. Thanks, this is an intriguing site. I would have to see a report to able to comment. although it's a lot of trouble to go to if it is not a building. I see what you mean about reciprocal structures. Interlace is built up in layers from the bottom to top, and is as strong as possible, and lacks the subtlety of reciprocal structures. p.s thnks x stopping by!! Is the rumoured discovery of another woodhenge near Stonehenge likely to relate to a similar building? How many of these things could have been needed or supported by the local population? 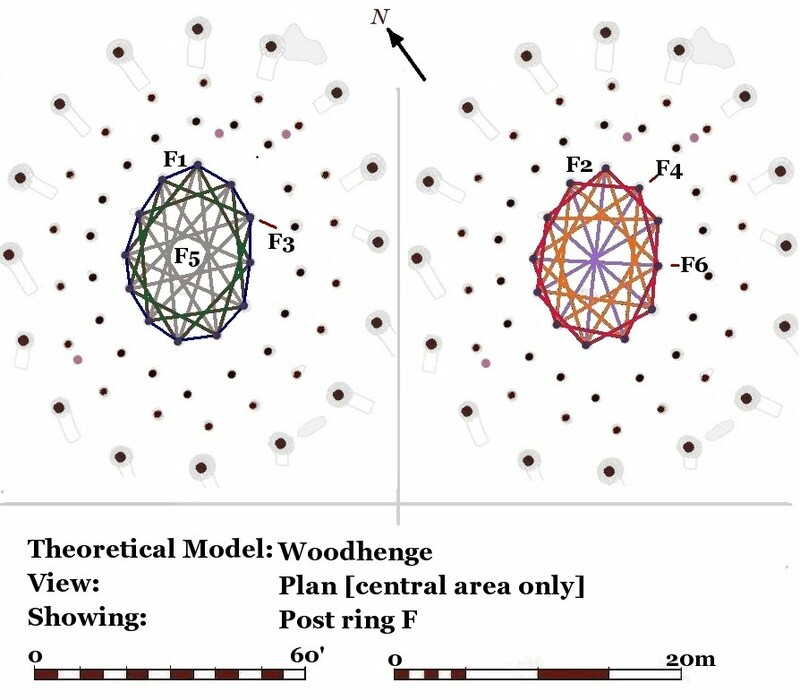 This discovery demonstrates the simplistic way Prehistorians think; it is round structure, apparently formed by postholes, and is near Stonehenge, therefore; "..It's a timber equivalent to Stonehenge” QED; [Prof Vince Gaffney]. It is only a geophysical anomaly, and as an archaeologist, I would have to wait and see the evidence of a proper excavation plan, before I could pass judgement. It is important to remember that timber buildings can be built for a variety of differing reasons, and that they had a lifespan. Architecture creates the covered spaces and structures that society requires, within the limits of the resources at their disposal. To conclude that all structures of the same shape, in this case circular, had the same function is simple-minded, and demonstrably false. However, it is the way that many Prehistorians view the world, projecting their own confusion and structural literacy onto the past. When will you be able to post the next instalment, explaining what the building was used for? What would it have looked like to a visitor approaching it? Would it have had beams sticking out at all angles like some gigantic Roc's nest? 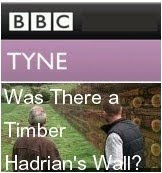 Would the walls have been timber, whitewashed wattle and daub, brick, stone or what? Where would the entrances have been, and might there we signs of avenues leading up to them or outbuildings, courtyards, farms and gardens, estate walls etc? Was this an isolated building or a town centre? I recently had issues with buildings in the real world, and had to move house under trying circumstances. In addition I have to have to have a small opp soon, so I have had to put back Work on the Woodhenge article till the new year. Very sorry, but it's important, so I want to get it right. In the meantime I have thrown together something on the levelling bulldozer of Romans civilisation - just to show I'm still alive and kicking. However, if any producers want to do a "Woodhenge / Stonehenge explained" I'll take on all comers for a very modest fee! Thanks Geoff. I hope that your operation is successful. I know moving house and having repairs done are real nuisances. Relax over Christmas, and I look forward to seeing more of your always thoughtful, ingenious and well-informed work next year. Thanks for kind sentiment, and I hope enjoy your winter solstice festival.